After the Migrant Labor Camp closed in 1940, it was re-opened as a branch of the Prisoner of War Camp located at Camp Beale near Marysville in 1944. Camp Windsor operated from mid 1944 to mid 1946. The function of the new camp was very similar to the migrant labor camp: to supply local farmers and ranchers an adequate labor force. 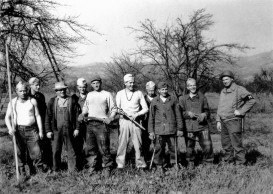 Prisoners were given a quick training in pruning the local crops of apples, pears, prunes, and grapes and were soon helping to maintain area orchards and vineyards. Camp Windsor was a curious operation during WWII. There are almost no stories of fear or ill will towards any of the prisoners. The government policy was to segregate trouble makers from the general population of prisoners and that policy seemed to work very well at Camp Windsor. 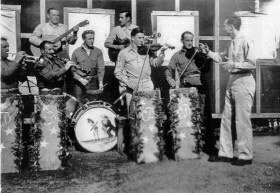 The photographs that exist show what appear to be very happy prisoners with one photo showing a rousing sing along with prisoner in costumes, musical instruments and drinking what appears to be beer. There was at least one escape but the prisoners were quickly re-captured. The local newspaper described the attempt as only a wish to see the Pacific Ocean. When the war ended the POWs were sent back to Europe where they worked an additional two years in England or France helping to rebuild those countries. They were not able to return to their homes until 1947/48. Some of the guards married local girls and stayed in Windsor, and at least one prisoner returned to live in Windsor for a short time. Both former prisoners, guards and locals all describe a very happy relationship.